Clive Griffiths will need no introduction to Worcester supporters in tomorrow’s Championship clash against Doncaster Knights at Sixways. 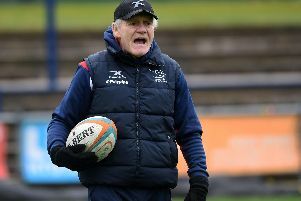 The Knights’ director of rugby spent several years at Sixways as the club’s No 2 after deciding to quit his job at Castle Park at the end of the 2006-07 season after steering the club to its highest-ever placing. Knights will be looking to build on last weekend’s 37-18 B&I Cup quarter-final win over Munster A at Castle Park but they could hardly have faced tougher opponents on their return to league action. Second-placed Worcester beat Knights (32-16) in their first home game of the season and will fancy their chances in the return. Unbeaten since the opening day of the season when they lost narrowly away to current leaders Bristol, Warriors boast both the best attacking and defensive records in the league. “We know it’s going to be tough down there but Jersey battled hard and picked up a losing bonus point and we’ve got to believe that we can also come away with something,” said Griffiths. “We dug deep against them when we played them at home after they got a flying start and we’ll be going down there without any inhibitions and no pressure on us. “I wouldn’t say that they are better than Bristol out of respect to them, but what I would say is that they are probably the form team in the league right now. “They have a massive budget and have strong all-round side with no real weaknesses. “We’ll just hope to find a chink in their armour.